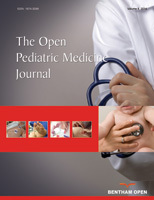 The Open Pediatric Medicine Journal is an Open Access online journal, which publishes research articles, reviews, and letters in all areas of experimental and clinical research in pediatric medicine. The journal accepts original research articles, letters and review/mini-review articles written in English. Supplements, proceedings of conferences and open access book reviews may also be considered for publication. This journal publishes open access reviews on recently published books (both print and electronic) relevant to the journal. Publishers and authors of books are invited to contact our book reviews editor at topedj@benthamopen.net with book review requests. All submitted books will be reviewed by an independent expert in the field. No page charges will be levied to authors for the publication of book reviews. If your research article reports the results of a controlled health care intervention, list your trial registry, along with the unique identifying number, e.g. Trial registration: Current Controlled Trials ISRCTN73824458. Note that there should be no space between the letters and numbers of your trial registration number. For this purpose, a clinical trial is any study that prospectively assigns human subjects to intervention or comparison groups to evaluate the cause-and-effect relationship between a medical intervention and a health outcome. All clinical trials, regardless of when they were completed, and secondary analyses of original clinical trials must be registered before submission of a manuscript based on the trial. Studies designed for other purposes, such as to study pharmacokinetics or major toxicity (e.g., phase 1 trials), are exempt. Trial registry name, registration identification number, and the URL for the registry should be included at the end of abstract and also in the space provided on the online manuscript submission form. If your research article reports the results of a controlled health care intervention, list your trial registry, along with the unique identifying number. Note that there should be no space between the letters and numbers of your trial registration number. All authors must strictly follow the guidelines below for preparing illustrations for publication in The Open Pediatric Medicine Journal. If the figures are found to be sub-standard, then the manuscripts will be rejected.